Demand management allows utilities and end customers to respond to market conditions as they change over time - either daily or hourly in most instances. Methods of engaging customers in demand management efforts include offering a retail electricity rate that reflects the time-varying nature of electricity costs or programs that provide incentives to reduce load at critical times. - State of the union – what's going on in the market? Conservation Voltage Regulation (CVR) is a way for utilities to reduce peak demand by lowering feeder voltages. 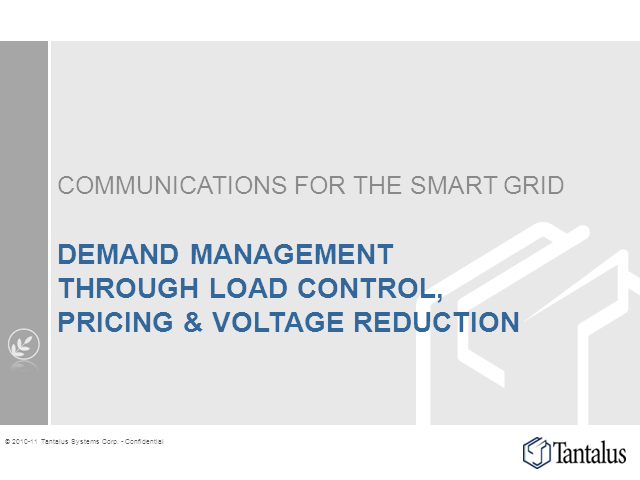 The combination of SCADA with a Smart Grid communications system from Tantalus adds real-time voltage information from thousands of meters, allowing utilities to maximize their voltage reduction operations while ensuring that every customer’s residence stays within the regulated limits. During this webinar you will learn about Tantalus’ new SCADA interface and the case study of Morristown Utility Systems (Morristown, TN) how the deployment of this interface has saved them time and money while meeting today’s demand response needs. Join Tantalus Systems and PayGo Electric to learn more about how utilities can use prepay solutions to improve performance. Utility companies are becoming increasingly creative with ways to price electricity so that homeowners can find rates that will meet their budgetary needs. Prepaid electricity is one option that is growing in popularity nationwide. Prepaid electricity plans allow homeowners to pay for electricity in advance, and can be a good option for consumers on a strict budget or who are interested in carefully monitoring their energy consumption. The key to managing your prepaid electricity is in using the electric meters provided by the utility company. Smart meters allow you to monitor electric use, providing readings multiple times per day. Advance pay utility plans can be a helpful tool in getting out of debt, because consumers are able to carefully manage the amount of money being spent for service, and even control the intervals at which they want to pay. When the money in your account runs low, you can make choices to control your spending or choose not to reactivate service until you are ready. Advance pay users spend less on electric service than in traditional programs, largely because consumers are more informed about their usage and reap tangible rewards for reducing use. The evolution from AMR to AMI to Smart Grid teaches that the communications network will be required to work harder, faster and carry a bigger data payload as advanced functionality makes its way onto the grid. Increasingly, broadband communications networks are seen as the ideal method for transporting the vast amounts of data that will enable utilities and their customers to interact in real-time in cost containment and energy efficiency programs.